The Bold and the Beautiful spoilers tease that Liam’s (Scott Clifton) continuing foolish behavior will push his wife into his father’s arms. Steffy (Jacqueline MacInnes Wood) was willing to give her husband many benefits of the doubt, but has reached her limit and is now seeking solace. Yes, the man she has been comforting will become her lifeline. Bill (Don Diamont) doesn’t know that his ex-wife (Katie, Heather Tom) has developed a relationship with Wyatt (Darin Brooks). That future explosion awaits. In the meantime, Liam’s eventual ex-spouse is rightfully distraught after being told that Sally (Courtney Hope) kissed her husband, twice. Could Liam be more of a goof? Yes, the future affords him more opportunities to prove it. Liam’s ideas about saving Spectra Fashions were ridiculous from the jump because of who heads that company. He knew that Steffy and Sally didn’t get along, to put it nicely, but still insisted on using the redhead as his martyr of the moment. People like Liam exist in a world of theory. Academics are often accused of residing in that dream state. But it isn’t one’s choice of profession that can be tagged as this problem’s source. No, it’s personality type. People in all fields of work foolishly buck the system. At Spencer Publications that was Liam. Bill’s unfavored son has a feeble business mind at best. He doesn’t properly assign value to how money is earned, preserved or invested. For him, the green stuff represents wrongs being committed against the little guy, or in this case, gal. Liam also doesn’t grasp how a meaningful relationship works. He thought that Steffy’s love for him wasn’t in question. It wasn’t, until he created the query. So why was and is Liam so intent on helping Sally? Diamont’s character has good instincts, which is a leading reason for the existence of his wealth. He knew that Liam was fond of Sally in a romantic way. Liam’s problem is that he is also unrealistic about himself. Any married man knows that his wife comes first. Loyal married women think the same of their husband’s, as Steffy’s defense of Liam until last week proves. But two couple switches were fueled when Liam crossed a moral line with Sally and felt compelled to tell Steffy about it. Liam and Sally could be nicknamed Siam, but Lally rolls better off the tongue. As for Bill and Steffy, well how about Dollar Still? 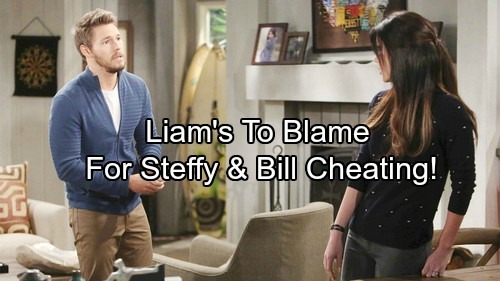 Is Liam To Blame For Steffy Cheating With Bill?